The new MINI Countryman is a whole new combination of distinctive MINI body language, absorbing handling characteristics, spacious interior of a five-door car and the looks of a Sports Activity Vehicle that give shape to an extremely versatile vehicle. MINI is and will always be an emotional car. A car you not just drive but live, whether you are alone on the road or you want to share the best times with friends. The MINI Countryman crossover bridges the gap between the classic MINI concept and a contemporary Sports Activity Vehicle. This unique quality propels the new MINI Countryman onto the radar of broader target groups, whose family or leisure pursuits have created an increased need for space and flexibility. A favourite among those who are keen to blend the extrovert style of the premium brand with power, functionality and comfort. The new MINI Countryman is available at MINI dealerships across India as a CBU (Completely Built-Up) unit from today onwards at an ex-showroom price of INR 3,650,000. Looks certainly matter and the new MINI Countryman scores high on that front. The bold powerdome, contoured bonnet, redesigned hexagonal grille, increased ground clearance, short overhangs and large xenon headlights with LED foglights together produce a commanding over-the-wheel stance ready to dominate the roads. Striking wheel arches and standard-fitted 17-inch alloy wheels also contribute to the visual impact of the new MINI Countryman. Chrome Line Interior and Chrome Line Exterior enhance the exclusive design. The horizontal proportions and vertical rear light clusters at the rear create a distinctively muscular look and underline the car’s sporting capability. The interior of the new MINI Countryman is very much in keeping with the brand’s familiar style but boasts a selection of new design and functional elements. The slightly raised seating position allows easy entry and optimises the driver’s view over the road. The dashboard is even more striking with its pronounced, concave forms and a sporty yet functional feel. The height adjustable standard Sports Leather Seats along with multifunction Sport Leather Steering Wheel add to the dynamic driving feel of the new MINI Countryman. Radio MINI Boost CD complimented by optional state-of-the-art 10 speaker 640 watt Hi-Fi Harmon Kardon music system provides entertainment for all moods. A newly configured range of interior colours, trim elements and upholstery materials allows for particularly harmonious combinations. There’s never been another MINI with so much interior flexibility or space. The backseat is now available in a 40:20:40 split, perfect for people who want a 100 percent MINI, plus a little more space for their life and luggage. The optional Panaoramic Glass-roof adds to the sense of roominess. The four-cylinder turbodiesel engine with common-rail injection and variable turbine geometry impresses with outstanding responsiveness and power delivery. An output of 82 kW / 112 hp produces a maximum torque of 270 Nm at 1,750 – 2250 rpm and accelerates from 0-100 km/hr in just 11.3 seconds to a top speed of 185 km / hr. The new six-speed Steptronic transmission stands out with its exceptional precision and shifting ability. At any time, in any gear, the transmission collaborates perfectly with the engine enabling it to utilize its optimum power and efficiency. The driver can also take over manual control or gear changes using optional shift paddles. With its precise handling and captivating agility, the new MINI Countryman transplants the classic ‘go-kart’ response associated with the brand into a new vehicle concept. These attributes are complemented by outstanding ride comfort, equipping the Countryman perfectly for a wider range of usage. MINImalism sets a new benchmark with a comprehensive package including Intelligent Lightweight Construction, Automatic Start/Stop function, Brake Energy Regeneration, Electric Power Steering, 50:50 Weight Distribution and many other innovative technologies. 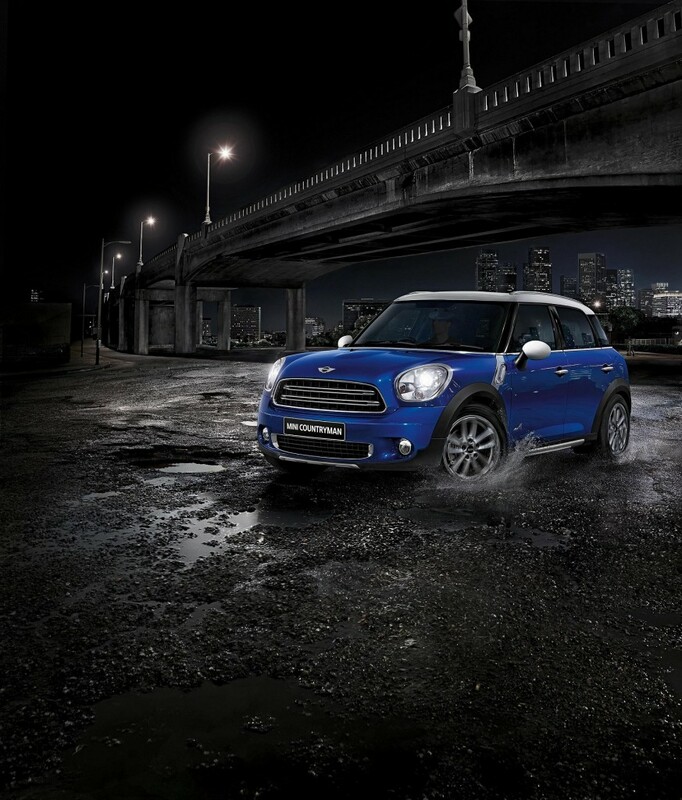 The new MINI Countryman is stacked with top notch safety technology. The standard safety equipment comprise 6 airbags, 3-point seat belts, Dynamic Stability Control including Dynamic Traction Control, Anti-lock Braking System, Brake Assist and Run-flat indicator. A MINI isn’t just a car. It’s a MINI. That’s why it’s packed with features you won’t find in any other car out there. The new MINI Central Display is also your window to the outside world. A pulsating hub of infotainment, it is also optionally available in the 6.5 inch display with Radio MINI Visual Boost. When hooked up to your smartphone with the relevant apps, MINI Connected provides an endless stream of digital information and entertainment. Follow your friends on twitter and tweet about your travel destination or check in on Foursquare when you get there.